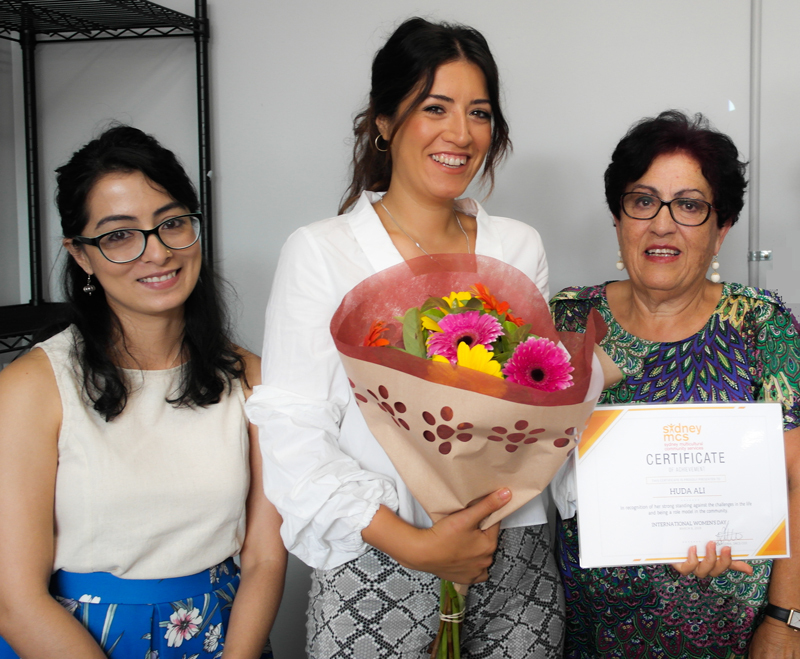 Sydney Multicultural Community Services (SMCS) hosted the event Inspiring Future to celebrate the International Women’s Day 2019. Six local ethnic-women were honoured for their accomplishments and for how they overcame challenges in Australia. Our youngest guest was born in a tiny village in the countryside of Ethiopia, called Kemba. Through life’s circumstances, she came to Australia when she was 6, she was adopted by an English lady who brought her to Australia. She was home-schooled by her mother until she learnt English. At the age of 14, she was given the opportunity to participate in the Youth Frontiers Mentoring Program – a NSW Government-funded youth mentoring program that connects students aged 12-16 with adult volunteer mentors. Sitota created a campaign called “Girls are the Future”. The labour MP, Linda Burny and the CEO of DVNSW, Moo Baulch were guest speakers in the successful event. Furthermore, in Year 11, she was successfully elected into the SRC to represent her community. She has been an active member of the team assisting a variety of charities and events such as Christmas Appeal, International Women’s Day assembly, Girl’s Day Out and White Ribbon Day Walk. Nishida arrived in Australia in 2013. Her journey started as a high school student and it wasn’t easy, she needed to grasp the language, adapt to the environment and accept the new challenges. Alongside her studies, she was working which allowed her to gain a lot of confidence and improve her communication skills. Currently, she is working at Woolworths and has recently been promoted as a service supervisor. Moreover, she is studying a Bachelor of Science at Macquarie University with a major in Chemical and Biomolecular Science. “I’m hoping to finish my studies in the next 5 years and get myself a job as a Medical Researcher”. When Laxmi came to Australia, back in 2007 from Nepal, she hardly knew anyone. Like any other migrants, food, culture and language were new. She could understand English but it was hard to communicate. She soon realized that Australia was a land of opportunity where education was the pathway to success. Despite the language barrier, Laxmi studied nursing while raising her two children. Nowadays, she works as an aesthetic nurse at Prince of Wales Hospital. She’s also Director of Niji Sushi Bar leading a team of 52 staff and if this isn’t enough, Laxmi is also a board member of Kingsford International Institute. Huda’s parents, Layla and Jaffer, were both born in Iraq with Kurdish heritage. Saddams reign in the 80s and the war that was taking place forced them to flee to Iran for safety. They made Iran home for some time where Huda was born. Due to the lack of acceptance of the Kurds in Iran and possible dangers of going back to Iraq her parents decided to migrate to Australia. Huda was 5 years old when she arrived in Australia. Her parents taught her the values of family, culture and religion and constantly they drill the concepts of education, hard work and success. Huda shared a beautiful story ‘A gentlemen asked me the other day how it felt coming from displacement and not necessarily being able to call a place home. I responded immediately with ‘fine’ because I’ve never really thought about it any deeper. That night, I let it play in my mind and came to a beautiful realisation: your first home was a woman’s body. Rana and her entire family came to Australia as refugees a couple of years ago. Despite facing numerous challenges adapting to a new country and its education system, Rana overcame a number of barriers with a smile on her face. Considering her short time in Australia, she is creating awareness of refugee young people’s settlement related issues and challenges to mainstream young people in the eastern suburbs area. She has shared her unique experience as a refugee kid in Australia at two different youth forums, attended by a number of young people from mainstream and multicultural background. Her family arrived in 1971 to Australia for a secure and safe life. Life was good in Australia but she got paralysed for 5 years, after her recovery, her husband passed away. Suddenly, she was a mom and a father. When she looks back she has no regrets, she is a proud mom of three. She is a very active community member, she assists the church and takes people to hospital. She is always there to help everyone. She is loved by everyone in the family and the community.